Oops, so there is no radish called 'girlie'. But aren't the colors -- pink, purple, red and white -- just gorgeous and ever so teenage girlie? 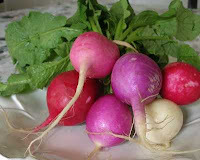 I set out for a recipe that would preserve the beautiful colors but still cook the radishes. Call my search half successful: the radishes cooked too long in the microwave too long; less time would likely preserve more color. The microwave? Yes! These radishes are cooked in the microwave! And the taste is truly extraordinary, creating something entirely different than the bite of raw radish. Very good ... and a great side dish, too, if not a salad. Many thanks to the husband-wife growers at Farrar Out Farm, who show up at my hometown Kirkwood Farmers market every week with fresh produce like my 'girlie radishes' plus eggs and pasture-raised Berkshire pork that I plan to try, soon! FROM THE ARCHIVES Til now, I've only cooked radish once but there are several radish salad recipes in the Recipe Box. For an easy make-ahead appetizer, there's no beating the surprising easy easy radish spread. 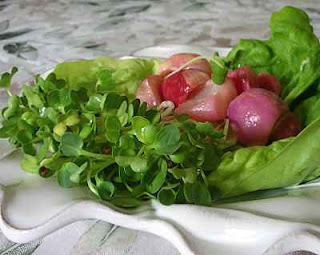 TWO YEARS AGO Fiddlehead Ferns, ... "utterly delicious and so very, very pretty"
Trim radishes. Cut in half, lengthwise (to show off more color); the pieces should be equivalent in size so small ones need not be cut, extra large radishes might be quartered. Place in a large microwave dish with vinegar. Cover with plastic wrap and cook til done. (Six minutes was too long in my mike for six radishes but it's the time specified for a pound by the recipe.) Toss with butter, seasonings and parsley. Re-cover and cook for 1 more minute. Meanwhile, wash/dry greens and arrange sprouts. Top with warm radishes and serve immediately. My mother in law puts scrubbed, whole radishes in her beef stew. It is quite tasty, mild and a different twist on beef stew. how would you cook the radishes without a microwave? Ranee ~ Three cheers for your Mum! As you likely know, radish 'bite' tempers during cooking so they'd act more like turnips or another (right!) root vegetable and so would be just terrific in a beef stew. Radler ~ I've only cooked radishes once before (at least in 'recorded memory', aka this blog), here's the recipe. BTW, if you're a new visitor, you'll often find links to similar recipes in the FROM THE ARCHIVES section. Or, check the Alphabet of Vegetables (there's a link in the upper right hand corner) to see all the radish recipes. I think you'll find it easy to separate the 'cooked' radishes from the raw radishes (and the carrots and the broccoli and ... and ... and). Girlie Radish Salad is perfect for this one! Yes the colors are grand teenage girlie! I keep running into rave reviews for braised radishes. I have a bunch in my fridge at home from the farmers market (but NOT as pretty as yours!) and am going to try it. Very few things in this world that braising doesn't transform in a wonderful way. I'll have to give this one a try, since I'm not fond of raw radishes. And for the record, I believe the girlie radishes are known as 'Easter Egg' radishes! I like them both. The Jack Bishop book has more every-day recipes, it's got quick go-to recipes. The Barbara Kafka book is more like a dictionary of vegetables, something to study. But I often find 'gems' like this, too. So ... depending on where you are with vegetables, one might be better than the other. Having just discovered raw radishes, I can't wait to delve into the world of the (slightly) cooked! I've always called the pink/purple radishes "Breakfast Radishes" and grew my own one year! They are the very best radishes ever. Now I'll have to try to braise them. Just found your site, and will definitely be back for more low cal recipes. Great job - thanks! !